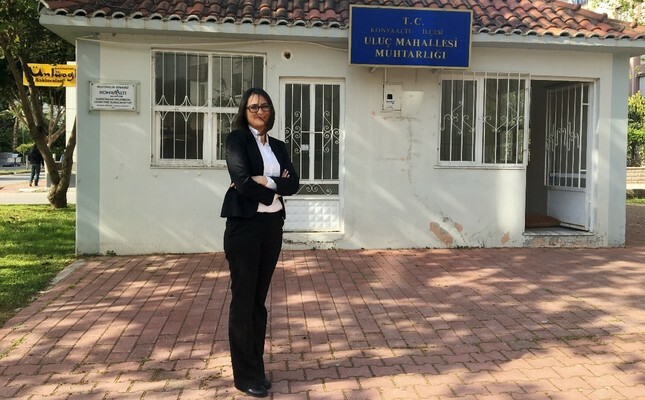 Hülya Bozkurt achieved electoral success in the Uluç neighborhood of southern Antalya province, April 12, 2019. The recent local elections witnessed one of the most cutthroat races in the country's history with some unconventional results, causing numerous objections and leading to a long, turbulent legal process. However, despite all the controversies and disagreements over who won, one group came out as the ultimate winner: Women mukhtars. More than 50,000 mukhtars, local neighborhood leaders who head the smallest unit of Turkey's demographic components, were elected in the local elections. Despite a relatively smaller number of women running for mukhtars as compared to men, female candidates stood out by gaining first-ever victories for women on the mukhtar level in various districts and provinces. The southeastern Batman province was such a province. Among the hundreds of mukhtar candidates, only 25 of them were women in Batman. Among these 25 women, 49-year-old Fatma Türkan, who has six children, managed to claim victory at the ballot box in the Sağlık neighborhood, where she had contested against seven men. Similarly, in eastern Elazığ province's Sugözü neighborhood, 28-year-old Seda Gündoğan won the race against a rival who had held the mukhtar position in the neighborhood for 10 years. By winning the race, Gündoğan, who lost her parents at a very early age, became the only female mukhtar of the province. Seda Gündoğan won the race in eastern Elazığ province's Sugözü neighborhood, April 4, 2019. Another woman, Hülya Bozkurt from Uluç neighborhood of southern Antalya province, achieved success only because she stepped in to save a friend who was meant to run but could not. Bozkurt was not meant to be a candidate for the race at first and was supporting her friend, Fikriye Fırat. However, when Fırat was hospitalized due to a heart attack and had to step down from the race, she passed the torch to Bozkurt. With only 20 days left for the elections, Bozkurt managed a successful election campaign by organizing many women to help her. "I could not stand the idea of disappointing my good friend Fikriye Fırat. Hundreds of women took action and despite having limited time, we organized our campaign well," said Bozkurt after winning the election. For some of the candidates, the victory was a little bit more challenging since they won with smaller margins. Nimet Yollu was one of those names who achieved success in the central province of Kırşehir with just a small difference in votes. Yollu became the mukhtar of the Esentepe village of Kırşehir by receiving only one vote more than her rivals, all of whom were men. In the eastern Van province, women showed great enthusiasm in the mukhtar race as hundreds of them ran for the position. In the end, four managed to secure the spot. One of these winners, the mukhtar of Bahçıvan neighborhood Nurten Sağlam, said that she was waiting for this day for five years. "In the previous elections, after I voted, a polling clerk asked why there was only one mukhtar candidate in the neighborhood. At that moment, I decided to become a mukhtar myself and shared this decision with my husband. I've been waiting for this day for five years," she said. The success of female mukhtars has reached a level where some districts are seeing a majority of women. In western İzmir province's Karaburun district, the district governor has been a woman since November 2018. In the latest elections, lots of women were elected to be mukhtars and the mayor of the district is also a woman for the first time in the district's history. Despite these achievements for women, only four of the 81 provinces' mayors are women, an unfortunate number considering the country's early achievements in engaging women in politics. Fatma Şahin, the candidate of the ruling Justice and Development Party (AK Party), became the mayor of southeastern Gaziantep province for a second term, while Özlem Çerçioğlu became the mayor of western Aydın province from the main opposition Republican People's Party (CHP). The other two female mayors were elected from the Peoples' Democratic Party (HDP), in eastern Van and Siirt provinces. Although the number is quite low, it is not very surprising since only 70 of the 769 mayoral candidates were women to begin with. Among the 13 parties that participated in the election, the Felicity Party (SP) became the one that failed women the most as it did not have any women contenders. The right to run for election and be elected was given to women in Turkey in 1934, making it one of the first countries to grant this right to women. With 17 women parliamentarians in Parliament in 1935, the country had a quite remarkable start in terms of welcoming women in politics. However, despite this promising start, numbers fell quickly and their political involvement in the running of the country became almost nonexistent. It took nearly 70 years for the number of female deputies to reach the level reached in 1935. In the 1954 elections, the number of women parliamentarians saw its lowest point with only two deputies. However, in the 1990s, the situation gained new momentum with the number of women in Parliament starting to increase again. The country also saw its first female prime minister for the first and only time, so far, in its history. It should also be noted that there were many obstacles for women in Turkey for them to be representatives of the people. For example, the headscarf ban was lifted in 2015. This law long prevented hijab-wearing women from being elected as parliamentarians. However, in the 2014 local elections, Turkey saw its first hijabi mayors with six hijab-wearing women elected, four from the AK Party and two from the HDP's predecessor, the Peace and Democracy Party (BDP). In these local elections, Istanbul also got its first hijabi mayor, with the AK Party's candidate, 54-year-old lawyer Şeyma Döğücü, becoming the mayor of Istanbul's Sancaktepe district. The AK Party has pushed for increasing the number of women in politics. The representation of female lawmakers in Parliament reached its highest level in Turkey with the latest parliamentary elections on June 24, 2018. For the 27th Parliament, 103 female lawmakers were elected in the parliamentary elections. The AK Party doubled the number of women candidates for provincial and municipal councils for the March 31 elections, compared to the last local elections in 2014. For the elections, 4,712 female candidates, including 2,551 substitutes, were nominated. More than a thousand among the 2,161 primary candidates are nominated in highly electable positions, reports suggest.